These are some big words to live up to. Yesterday was a good day for America’s Quarterback, Pro Bowler Jameis Winston. 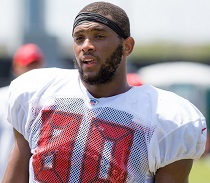 He was at One Buc Palace working out with his teammates. One Buc Palace is Jameis’ happy place. But yesterday, Joe isn’t sure what motivated Jameis, whether it was just unbridled joy or a way to motivate one of the NFL’s most talented young players to reach for the heavens this season. Jameis started throwing out lofty goals for Bucs tight end O.J. Howard. The way Jameis talked him up, it sounded like Jameis had already ordered Howard’s bust to be created for his Canton induction. “The sky’s the limit, really,” Jameis said of Howard. “Not even the sky – probably the moon. Why limit him there? This guy is incredible, but I think he and Cam [Brate] really complement each other well. I think O.J. can learn a lot of things from Cam, but I believe having both of those guys is going to make our offense go to the top. This will be an interesting year for Howard. First, as Jameis hinted, it would be nice for Howard to stay healthy for the full season. He was on his way to an incredible year when he got hurt (again) late in the season and was placed on injured reserve. That was the second of his two NFL seasons that ended that way. For a guy to be considered a star, he must answer the bell when the games count the most, you know, in December and beyond. It will also be interesting to see how Bucco Bruce Arians uses Howard, who is clearly the most talented tight end Arians has ever had to work with on the NFL level. Aahh yes, the dilemma … how to keep your top offensive weapons from getting hurt. OJ only played in 10 games in 2018 and 14 games in 2017 before ending up on IR both seasons (the Pats’ Rob Gronkowski’s career took a similar path … starting in his 3rd year IMO). Yes OJ is a great blocker, BUT … it obviously takes a toll. His snap counts were usually much higher than Cam Brate’s in the same games it looks like & it cost him (through 10 games OJ had 436 snaps & Cam had a much lower 259 snaps). Some good news is that Anthony Auclair’s snaps increased quite a bit after OJ went on IR, so hopefully he can help distribute the blocking ‘workload’ more this year. The Chicago coach deployed a smart strategy against us of flooding the zone with more receivers than there were DB”s. Not only is OJ a mismatch, but could present a lot of problems for defenses when coupled with other receivers deep. Would love to see him stay on the field all year. Also, for some reason, Howard and Brate were rarely on the field at the same time. It was either one or the other. I would really like to see them used together. Only OJ can stop OJ! work extensively with him in the preseason to improve this important aspect of his game.. It will be necessary if we ever have a back that can make big plays from the screen game. Maybe they’ll run two tight end sets and then split one to the slot vacated by Humphries. Howard is a tough person to tackle if he has a head of steam. Howard is so fast he is basically an oversized receiver. A very large receiver. And you got mike Evans a physical freak of nature at receiver who needs to be doubled. They have some behemoths. Godwin in the mix. Perriman . Watson . And they will probably draft another slot or speed guy. I agree, the weapons they have on offense are the best we’ve ever had. Maybe best in nfl. Still don’t understand how we struggled to get 7 on a weekly basis. Could go up and down the field between the 20’s. Call it coaching that’s fair. But with these freaks at receiver , these guys don’t need coaches calling plays. Sandlot/backyard football. Jameis should feel blessed to have these weapons around him. should get open in the scramble drill. If the big fella can stay healthy for a season he will be a force to reckon with. So far we’ve only seen glimpses of potential greatness. Hard to make it into Canton from injured reserve. That would be a tough sell even for The Sage of TB. Bob … ^^^^^ agreed. OR we could just bring Mike Alstott out of retirement, hand him the ball, and point him straight ahead while our OLine grabs a water break. Talk about big receivers, what if Justin Watson 6-3 225 steps up his game this year? And what if they draft in 6th round RB turned WR Jalen Hurd/Baylor 6-5 226 who is coming in for a private visit? With Evans and OJ, now that would be firepower. Go Bucs! And the Bucs keep looking under rocks too! AAF tight end Nick Truesdell 6-6 252 visits the Bucs today Wednesday. Had 24 catches, 269 yards, 3 TDs for Salt Lake City in eight games. People are completely forgetting one of the main reasons why our offense sucked last year, and that is……. ………also equals bad run game. So opposing defenses just tee’d off on the QB and sat in a cover zone D.
OJ Howard……WR?…..Interesting……why not. Use the 2 TE sets more often & let’s see. I can tell you this…..if I were a defender he would be the last person I would want to defend. Posts continually moderated and then not showing up……what’s up? No running game and an inaccurate down field (no deep threat ) will stop most offenses . This elevates an opposing defense from bad to good and from good to great . Cut all the crap , protect better, play top 12 defense, run the ball and complete a few more deep balls AND SHA ZAM !!!! WINS will FOLLOW !!! Those have all been weaknesses under Licht for 6 years now !!! Everyone has weaknesses and tendencies it’s up to Bruce to step in for the lack of team president and poor ownership ( handling/ helping GM) and fill the role / identify and correct Lichts tendencies and weaknesses!!!!! Jason says Bruce save Me !!! 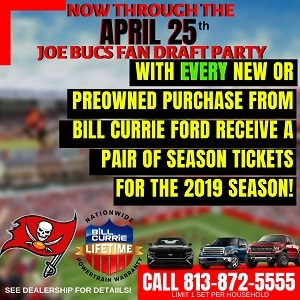 Do the Bucs have as much talent as any team in the league , Hell No !! Do they have as much or more than New England , yes they do but New England’s lesser talent still does the above mentioned well !!! One other difference is they attack your def weakness on any given play and their D takes awAy the offenses strength . Most other teams pre script and force their pre scouting narrative, it’s not all talent it’s not being stubborn and actually doing things well . ( Not Relying on Talent ), doing things well and letting talent shine ) This is not the BUCS !!! Howard doesn’t mean SHAT if the team doest get smarter and Eun Better from the Top Down !!! Bruce Save these Clowns , Please !!!! BA and byron will do wonders with this personnel group…. So far, there are two things that can Stop OJ80!!!!!!!!!!!!!!!!!!!!!!!! 2019 will reveal answers to the sheep, that the real fans already know!!!!!!!!!! Dalvin Cook was the pick. Just like Stephen Jackson was the pick over Michael Clayton.